A cure for acne is one thing, but once you cure your acne you are probably going to need a remedy for acne scarring. Post acne marks and scarring do not have to be permanent reminders that plague your complexion. 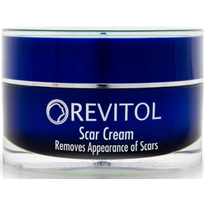 Revitol designed a scar cream that should help improve your skin tone and texture. It claims that it can finally rid your skin of the terrible reminders of your pimple days. Does it really work? We need to look at the ingredients and consumer reviews before we can make that determination. Revitol Scar Cream offers a rich spot treatment that should take care of age spots, dark spots, and residual acne marks.The power behind this product relies on its formula. The key ingredient in Revitol Scar Cream is hydroquinone. The exact concentration is unknown, but this ingredient is a powerful bleaching agent. Hydroquinone whitens the skin and reduces skin coloring for an even skin tone.To amplify the effects of hydroquinone, this scar cream uses retinol, dimethylaminoethanol (DMAE), and copper peptide. Retinol is a vitamin A derivative. This ingredient seeps into the skin to increase cell turnover. By increasing cell turnover new skin can replaced the damaged skin. DMAE as a topical treatment is more beneficial when combined with vitamin C. We don’t see any real benefits from DMAE in this scar cream. However, copper peptide has several qualities that help improve your skin condition. Copper peptide has anti-inflammatory properties to smooth skin texture and can also heal wounds and offer antioxidants.So far Revitol Scar Cream sounds like a miracle worker but before you commit to this cream you should know a few more things. Is Revitol Scar Cream Safe? Hydroquinone may be a good skin lightening agent, but it has its flaws. Hydroquinone has been known to cause a skin disorder called exogenous ochronosis, which causes black and blue pigments on the skin. Additionally hydroquinone is banned in several European countries and on a “FDA watch” in the United States because it could be a potential carcinogen. Although Revitol Scar Cream works to help reduce acne scarring, the safety of using hydroquinone is still in question and we would recommend being safe rather than sorry.